As a musician in Australia, there are few more isolating places to carve out your craft than West Australia. For former frontman of The Decline Dan Cribb, this sometimes seemingly insurmountable geographical isolation was overcome in the most unexpected circumstances. After reaching out to Nick Diener from cult US punk band The Swellers to lend his tracking skills to Cribb’s EP, the connection to the material was so strong that Diener ended up contributing bass and vocals on every song. After finally meeting at The Fest in 2012, the casual collaboration morphed into a friendship and then a partnership as Diener eventually became an unofficial band member for the recording of a debut album. Thus Dan Cribb & The Isolated was conceived. Despite the mammoth distance between collaborators (approximately 17,689 kilometres) The Isolated became a celebration of the connecting of communities. Music is after all, a universal language. In this instance it’s also the language of hooky-as-hell punk rock. As We Drift Apart lends heavily from the mid 90’s punk rock heroes who defined the Fat Wreck generation with melody-drenched, riff-heavy, rowdy rock. Bad Religion harmonies preside over Lagwagon hooks, and jubilant Me First and the Gimme Gimmes refrains but with a slightly Frenzal-esque fury. Mixed and mastered by Mark Michalik (The Wonder Years, The Swellers) at Chicago's Drasik Studios, the full length is a welcome and notable progression from Cribb’s 2012 acoustic EP. Following the sudden release of first taste The Last Time in February, the album’s lead single Let’s Move To New York (featuring Kisschasy vocalist Darren Cordeux) premiered nationally on triple j’s Short Fast Loud last night. 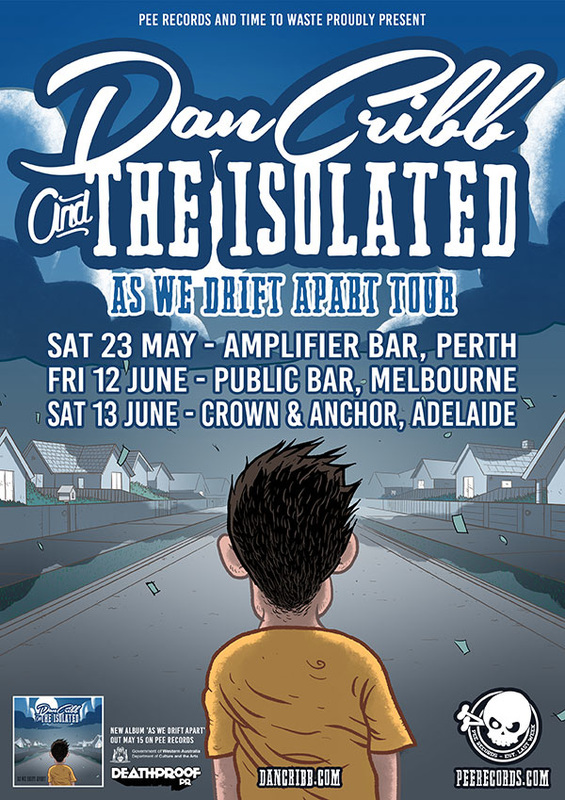 Fresh from supporting slots with The Bennies, Rise Against and Frank Turner, Dan Cribb & The Isolated will launch As We Drift Apart this winter. Don’t be a stranger.